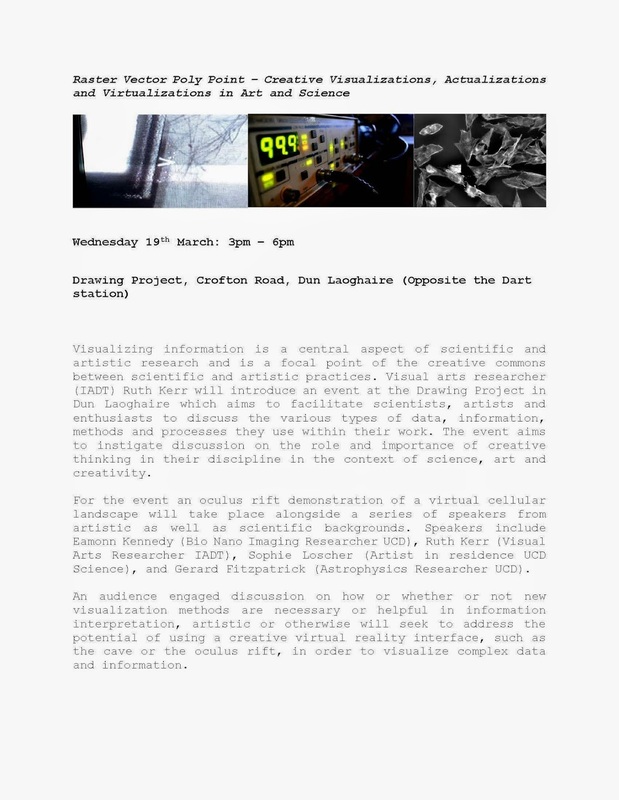 Recently I hosted a research dissemination event at the Drawing Project in Dun Laoghaire. Above is an image of the blurb for the event. 'Romantic Cells' duratrans print on display at the event. Grainne and I at the event. A visitor at the event using the oculus rift cellular landscape demo we developed for Raster Vector Poly Point. We developed a cellular landscape based on the AFM data gathered from scanning the surface of a dying cancer cell to create a cellular terrain that the user can jet pack across. 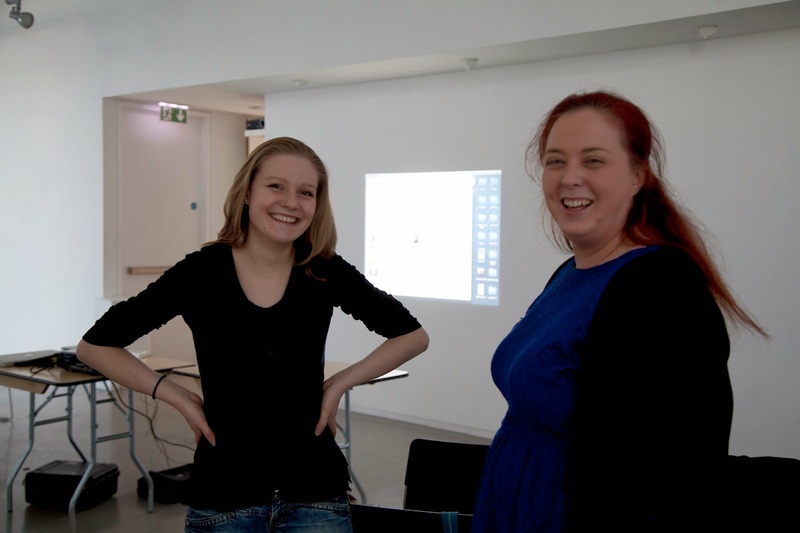 Me introducing Sofie Loscher, UCD Science artist in residence. Sofie introducing her work at the Drawing Project event. Sofie discussing parallax and equilibrium at the event. Eamonn Kennedy, bio nano imaging researcher at UCD, introducing his talk - 'A reductionists guide to Art and Science'. Me speaking on my theoretical ideas behind my research project. 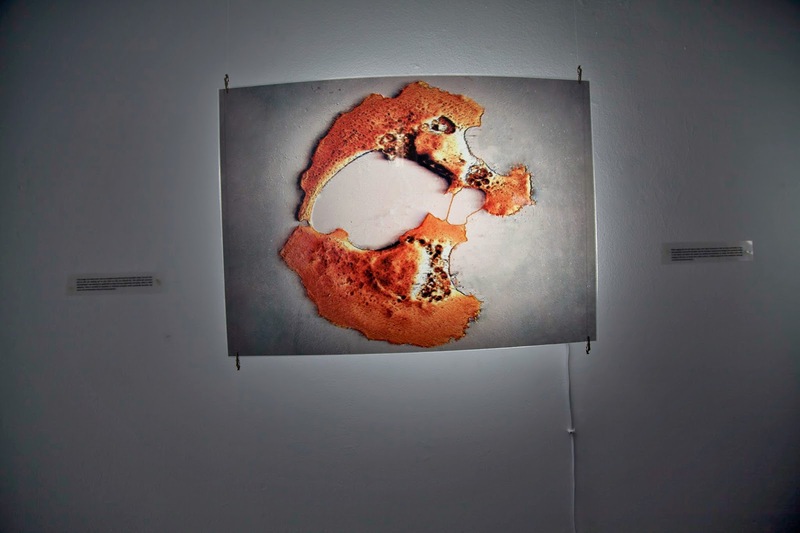 Illuminated duratrans prints of dying cancer cells. My supervisor, John Buckley, using the demo of the virtual immersive cancer cell landscape. Gerard Fitzpatrick, an astrophysics researcher at UCD currently working on gamma ray research. Gerard did a talk on programming languages, his research in gamma ray astrophysics and procedural generation in video games. After the talks and cellular landscape demonstration we had a questions and answers session with the speakers and audience. Eamonn answering a question asked by an audience member. Dr. Anna O'Faolain de Bhroithe, a ressearcher in very high energy astrophysics at UCD, contributing to the discussion on the issue of the institute of science versus the institute of the humanities. This discussion focused on the place of art within science. Gerard Fitzpatrick contributing to the discussion on fictive artistic elements within the publication of scientific research and the issues associated within the aspect of scientific publication.